Hello loyal friends and dedicated Fairy followers. As if life isn’t scary enough for a sensitive little piggy such as me, my mousey family mentioned that something called Halloween was happening and Halloween meant everything would be ghostly and witchy and scary and pumpkiny and . 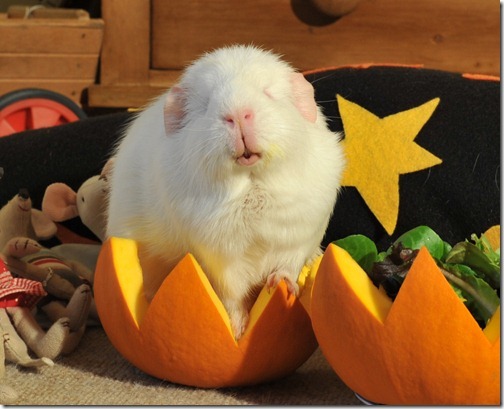 . . actually, I am not sure where pumpkins come into it. 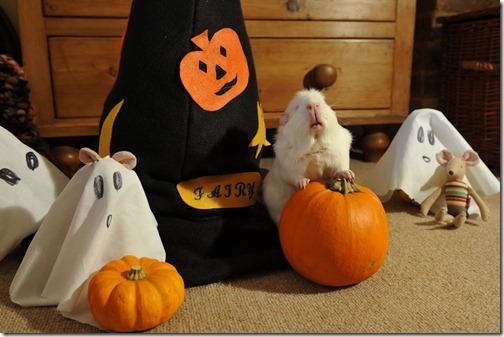 They are not at all scary – in fact they are rather tasty. Perhaps people should get their facts straight before concocting such nonsense. 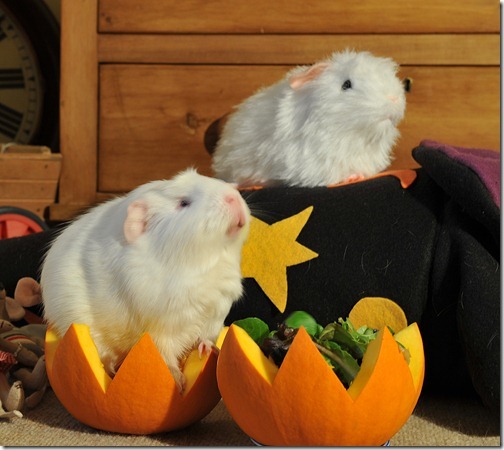 In actual fact I’ll be having extra scoop of that little munchkin-pumpkin later for after afters. 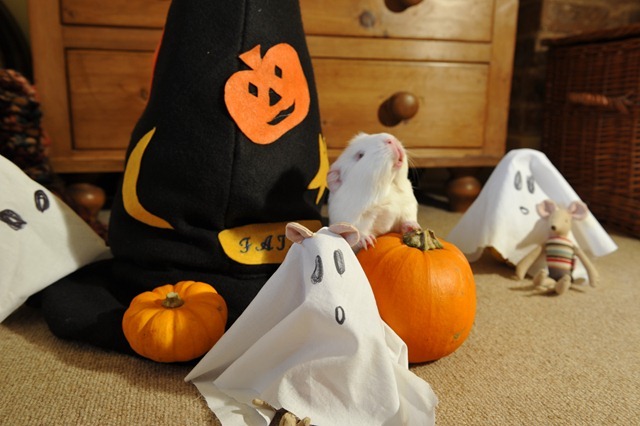 Anyway, to get back to the subject in paw – Halloween sounds just the ticket – let the spookiness commence! 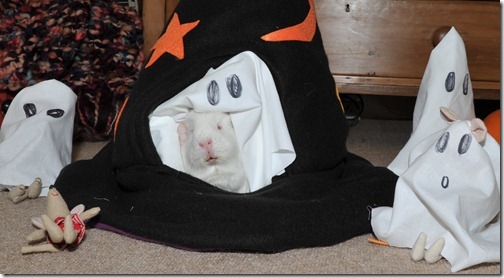 So, Monty, is that Minty hiding under that spooky sheet then? Huh, not exactly scary is she? I am not even scarred a tiny bit. Errr, it is Minty, isn’t it??! But hold your pumpkins . . . what’s that Halloween type Witchy contraption lurking over there? Looks tailor-made for a tiny, petite elegantly furry Fairy-sized piggy. No good for big bottomed Mariella or furry-bloomers Marigold either. 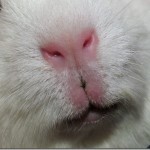 Move over a bit Monty and mind you don’t go poking your pointy nose where it isn’t required. 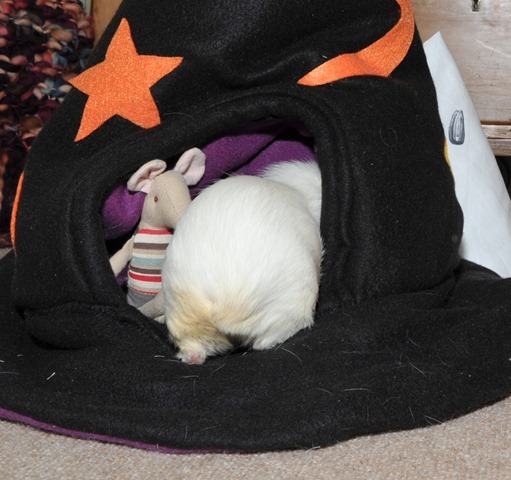 I am sure this comfy snuggle hut Witchy hat must be just for little ol’ me. I expect it has my name on it somewhere. You could be forgiven for being lulled into a false sense of security inside here. 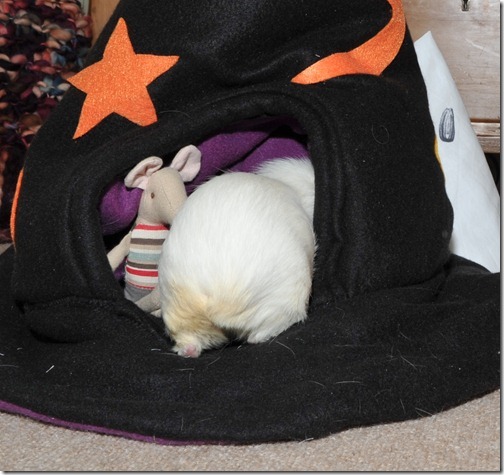 Talking of which, I think I have visitors – Eeeek! Look! Scary ghosties! MUMMMMMMMMY!!!!!! 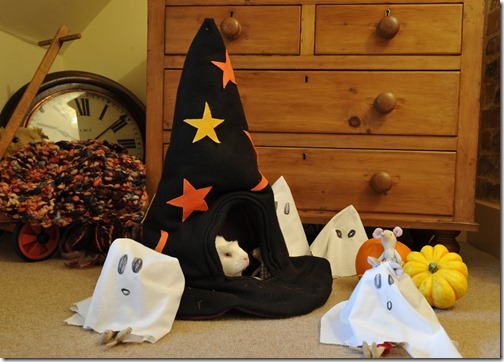 Eeeeek, Eeeeeeeek and Eeeeeeeeeeeeek again – those spooky ghosties have ghastly mouse type ghoulish feet poking out everywhere!!!!! Just a spooky minute – they all have suspiciously familiar mousey type tootsies. What on carpet is going on? 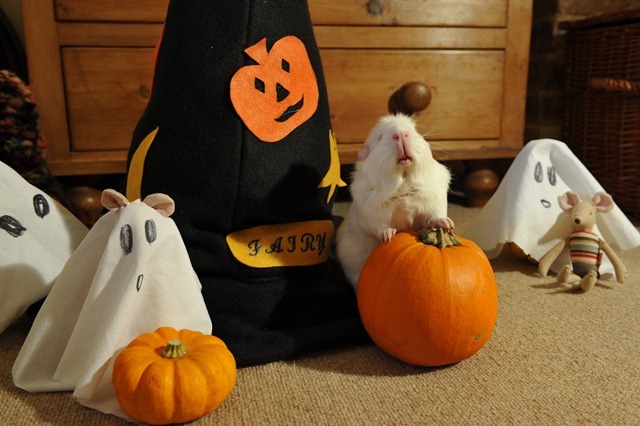 Oh I see – on Halloween you dress-up as exceptionally unconvincing ghosties and people give you treaty type nibbles?! LOTS of treaty types of nibbles – to go away??!!! Wow – I could get used to these singularly secular celebrations. Well, if you mousies are all going to dress up and try to be really scary, I may as well join you and take charge – although I don’t really see WHY I need a ghosty sheet, I am already very ghostly with my own beautifully white fur coat – whhhhhooooooooooooooo! Pick yourself up, Mabel dear. Oh! You fainted with fright! Well get UP, this isn’t the time for lolling around. There are serious treat collecting type activities to undertake. 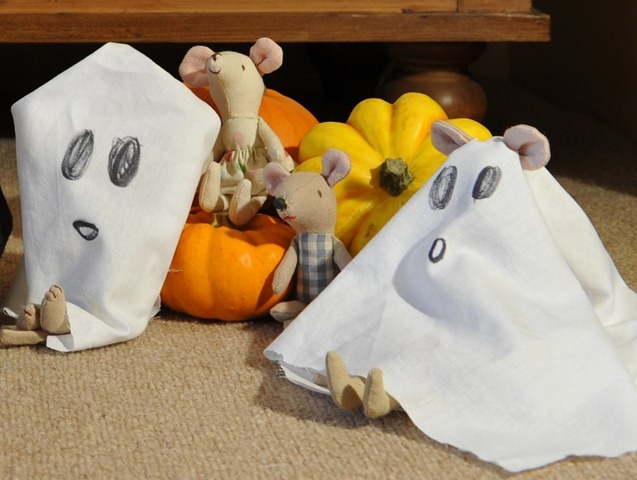 Right all you talented ghostly mousie apprentices – grab your ghostly costumes. 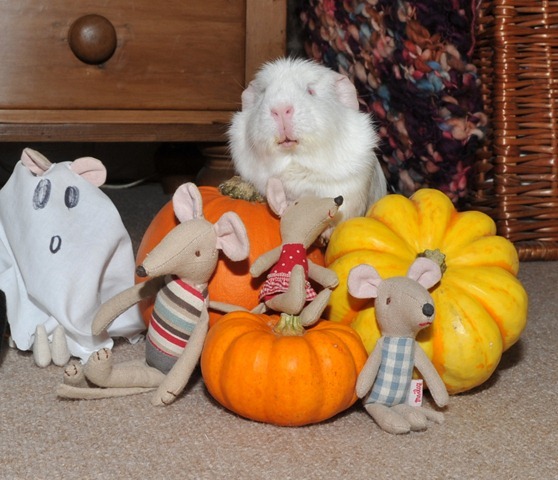 I want a good clean scarefest with lots of wooooo’s and waaaaaaaaaaaaah’s and those sorts of things. 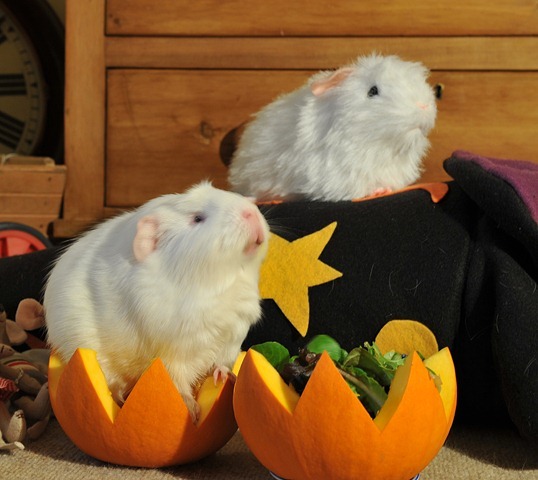 Let’s scare everyone silly and make sure they give me, ooops, us double helpings of treats! Very convincing . . . love the disembodied ear motifs! Good work. I just need a few moments to get into character. What do you mean, “Fairy would make a good Goblin”? I heard that Monty? We are PRETEND ghosts, aren’t we? Just double checking. I knew that. 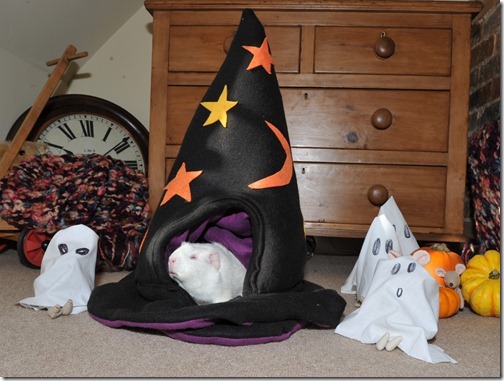 Right – lets get treat collecting – errr I mean scaring! Whoooooo . . . . and whoooooooooooooooooo some more . . . .
MUM . . . . DAAAD! ANYONE! Even Marigold and Mariella . . . . HEEEEELP! There are genuine, real ghosts everywhere. Get lots of those tasty treats that I like a lot, to make them go away! Whoooooooooooo . . . quick – hurry up with those treats. Lettuce and things, especially things. They should help reduce the scarinessability. Don’t be frightened, now, bring ‘em on and be extra quick about it, please. I bet you were all really frightened! Don’t worry – I was only pretending to be scary. I am still the ever popular furry bundle of cuteness you all know and love. But if I didn’t get my treats I was fully prepared to UNLEASH HELL – or even my TEETH. 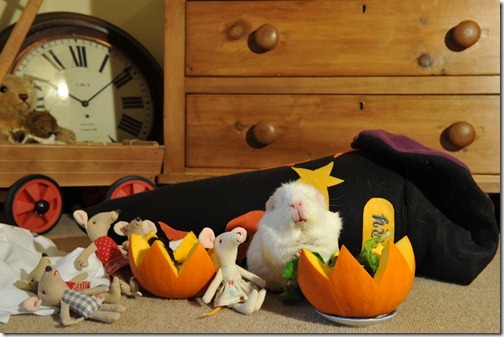 If Mummy and Daddy hadn’t piled my special pumpkin pie-dish with sufficient yumminess – I was going to get Mariella to sing! Now THAT would have been scary. 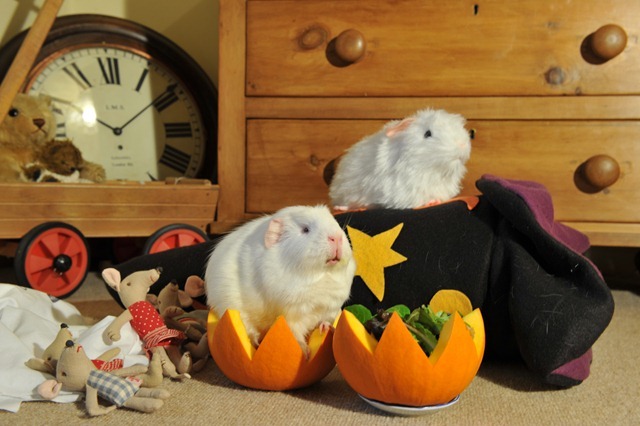 Looks like the greedy mouses have eaten far too many of their treats already! 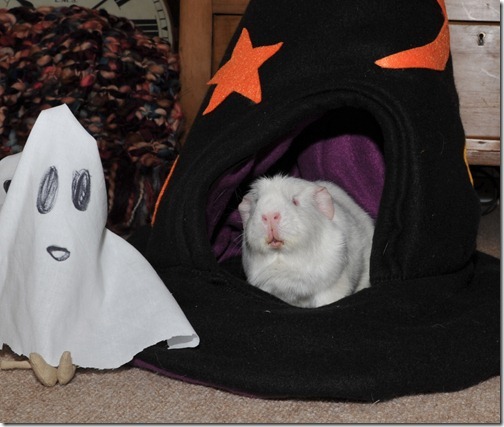 You know, some people really think there ARE real ghosts out there – me? I don’t believe a word of it . . .
. . . but sometimes, if I squint my eyes and peer sideways, I think I CAN see ghosty guineas . 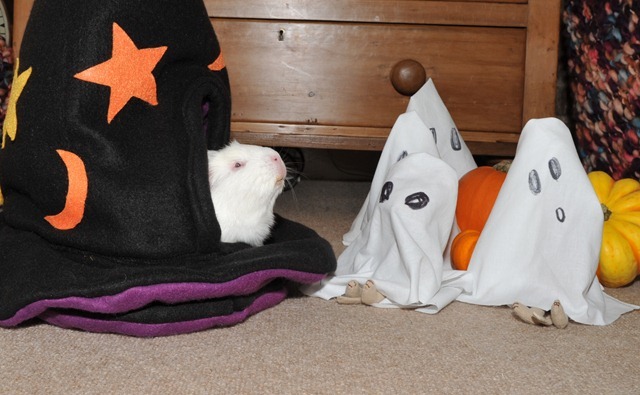 . . one thing is for sure, they are NOT getting MY treats! The very idea! 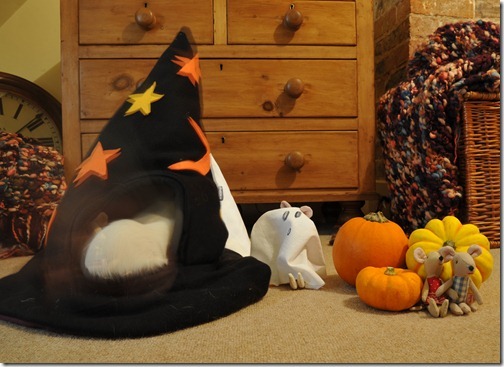 What a spectacularly successful Halloween we had! 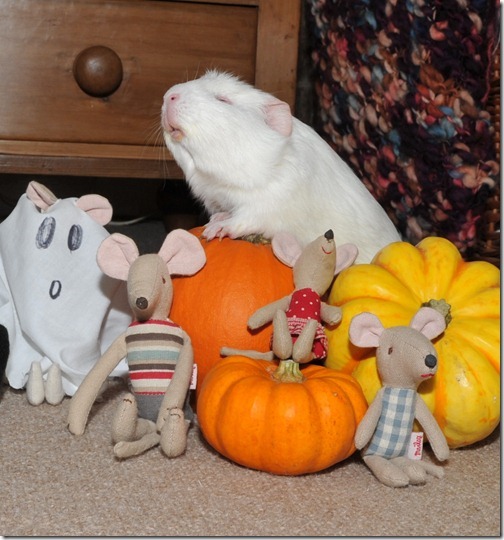 All that scareyfying and treat nibbling has made me hungry! This is hilarious! Fairy is such a star, she really does tell her own story, her expressions and funny little ways . . . we all loved it so much! 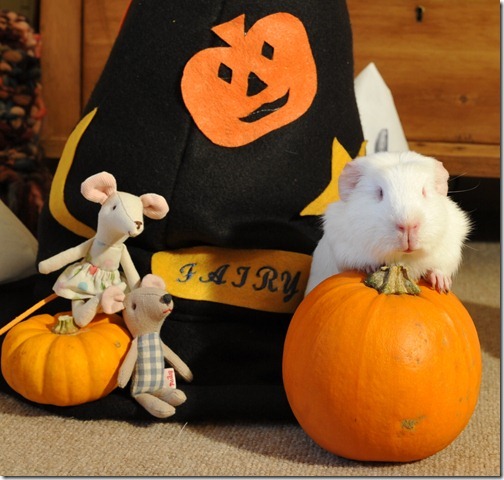 We have been following Fairy’s blog for a while and although it is always really really good, ths story really is the best yet! Thanks! Hysterical story Fairy. I was a bit worried you really were scared! Do pigges like to eat pumpkins or do they just make a good bowl to fill up with salad? Fairy, scared? I don’t think so!! ‘Twas Three Nights Before Christmas! Fairy Welcomes A New Princess!